Stem Cell Transplant 12 year -new birthday!! NAPSI)—You may be surprised to learn that multiple myeloma is the second most common cancer of the blood, after leukemia. It starts in plasma cells, a type of white blood cell. In time, myeloma cells collect in the bone marrow and may damage the solid part of the bone and eventually harm other tissues and organs, such as the skeleton and the kidneys. In fact, there are approximately 114,000 new cases diagnosed every year. If you or a loved one is among the 230,000 people living with multiple myeloma worldwide there are a few facts you should know. For many people with the disease, an autologous stem cell transplant may be an answer for eligible patients. 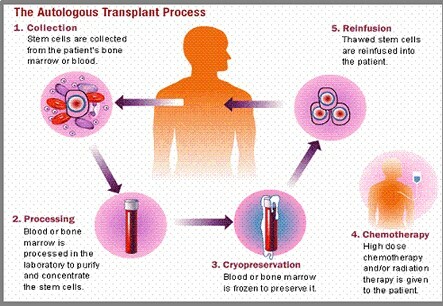 This involves collecting the patient’s own blood-forming stem cells and storing them. He or she is then treated with high doses of chemotherapy or a combination of chemotherapy and radiation. This kills cancer cells but also eliminates the remaining blood-producing stem cells in the bone marrow. Afterward, the collected stem cells are transplanted back into the patient, so the bone marrow can produce new blood cells. To help people learn more about the disease and its treatments, the Multiple Myeloma Journey Partners Program was created. This peer-to-peer education program for patients, caregivers and health care providers leverages storytelling as a tool to improve the patient experience. Journey Partners are multiple myeloma patients who have experienced similar emotions, faced the same challenges and asked the same questions about living with the disease. A Multiple Myeloma Journey Partner will come to any community in which 10 or more people would like to attend the free one-hour educational seminar. The main benefit is that multiple myeloma patients know they’re not alone, and the program provides educational resources and services that help patients and families navigate their journey to achieve the best possible outcomes. For more information or to request a program, you can visit www.mmjourneypartners.com. Anyone interested in becoming a Multiple Myeloma Journey Partner can contact the program coordinator listed on the website. The program is sponsored by Sanofi Genzyme, the specialty care global business unit of Sanofi focused on rare diseases, multiple sclerosis, immunology, and oncology. In 2008, Traver Hutchins was the president of his own health care education company. Strong and athletic, he did not hesitate when a financial backer asked him to have a check-up as part of the insurance process. It was, after all, a standard and routine request. What happened next was anything but routine. Hutchins was profoundly affected by the diagnosis. “My father died young of a blood cancer, non-Hodgkin lymphoma, when I was a teenager,” he says. Remembering the effect of that tragedy on the rest of his family, he re-evaluated many of his own life choices. Hutchins waited for four years after the initial diagnosis before he experienced his first symptom: back pain he attributed, mistakenly, to a hockey injury. After months of physical therapy, an MRI revealed that he had a compressed vertebra and bone lesions, the result of an accumulation of plasma in his spine. Following the MRI, Hutchins underwent his first treatment: kyphoplasty to restore the vertebra and a combination of medicines. His cancer went into remission. But given the current state of myeloma treatment, relapse is inevitable.1 He bided his time. For three years Hutchins monitored his blood levels diligently but they did not register his relapse, not even when he experienced more back pain and a return of the cancer in early 2016. After two rounds of radiation, another kyphoplasty procedure, and a laminectomy to relieve spinal pressure, Hutchins chose to undergo a more invasive treatment which involved the replacement of bone marrow with stem cells. To induce a remission in advance of the transplant, he underwent two rounds of induction therapy. The first round failed, but the second round was successful. Hutchins received a stem cell transplant two weeks later. “I have about a month of being hypersensitive to avoid any potential infection,” he says. He looks forward to the day when multiple myeloma is considered chronic and manageable, rather than incurable.